Architects for the Experience Age – Let's Go Be Great! Tell us a little about Tahzoo. John: At Tahzoo, we call ourselves, ‘Architects for the Experience Age.’ Ultimately our mission is to change the way brands and people engage. Today people value the experience itself more than the product or service they buy. This means that every company is in the experience business. For us at Tahzoo, that means leveraging marketing technology to help our clients deliver personalized experiences across every channel, device and platform. Our founder and CEO Brad Heidemann cut his teeth in customer experience during his decade in management at Nordstrom. Central to Nordstrom’s culture was treating every customer as an individual, providing the best customer experience and anticipating what they want. Later in his career, Brad learned about using data and technology during his next ten years at Microsoft. It is the bringing together those ideas around the mix of customer experience and technology that formed the basis for the creation of Tahzoo. One of Tahzoo’s core values is, if you care for your customers and employees, you will have a company worth caring about. We understand that it’s critical to deliver great customer experiences, but we are also a business, just like all our clients. At the end of the day, we have to be able to deliver measurable and repeatable business outcomes. What are the biggest challenges you see your customers face? How has this changed over the years? 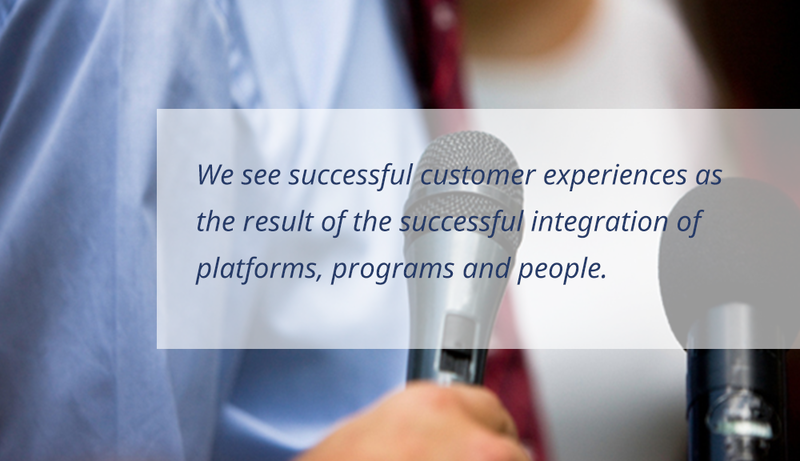 John: We see successful customer experiences as the result of the successful integration of platforms, programs and people. The platforms provide the foundational and technical layer. The programs are the experiences actually delivered to the end customer. And the people refers to the organizational readiness and change management that have to take place within a firm. This last point is real the biggest Achilles heel for most companies. Everyone recognizes the importance of change management, but very few make the effort to get it right. Tahzoo recognizes this, and that’s why we’re committed to be our clients’ partner for the long run. Not just install and leave, but really focus on what a company wants to achieve, how they want to use technology, how they’re going to do it and who needs to contribute. And in the end making sure it delivers the intended value back to the business. Scott Brinker and his famous martech landscape infographic depicts over 4,000 different software vendors in the martech world. For virtually every company, this is almost incomprehensible. And whenever a corporate marketer talks to a software vendor, they are told they have all the answers wrapped up in a single “marketing cloud.” The reality is that this isn’t the solution for most companies. They are not ready to rip out all the investments they have made over the years. When it comes down to it, there are three primary categories of marketing technology that every enterprise needs: a data hub, a content hub and an experience engine. The data hub is built around the notion of becoming the single center of truth about the customer. The idea of an enterprise content hub is similar. In order to approach the dream of omni-channel or real-time marketing, all content must be managed in a single manner to enable consistent experiences regardless of the channel. And finally, once you have decided who gets what content, and when, where, how and why, you simply have a publishing and distribution problem. I think SDL has brought together the content and experience sides of the digital customer experience. When you combine that with best of breeds analytics and business intelligence offerings you have the basis from which to create experiences. How does Tahzoo its customers tackle these business challenges? John: Tahzoo services help its customers figure out the relationships between their disparate technology platforms. In a lot of cases, our clients have 65 to 70 percent of the pieces in place but their technology is siloed, outdated or they don’t yet take full advantage of the capabilities they have. Often, they need to look past their number one campaign management tool – Excel – and figure out how to deliver the programs that can take advantage of the technology they have, what their data architecture should be, their content strategy and content taxonomy so that they can deliver more relevant content to people. We help them map their audiences to content using outside/in collected data points to create relevant journey maps that look beyond just demographic data and includes the mindsets and motivations of prospects and customers at different stages. Today we’ve completed more than a hundred enterprise customer experience engagements that include experience design, content strategy, data architecture, marketing technology, implementations and integrations. For organizations that want to manage and create experiences, it’s more than just plugging in another piece of technology: it’s about making it work together. We are continuing to invest in helping companies achieve a meaningful user experience through both technologies for information architecture as well as designing for the experience that creates a flow. By bringing together information architecture and design, we blend form and function. Soon we’ll launch Tahzoo Studio as a way of combining these elements. In what way do you think SDL Web provides a differentiated solution? John: SDL Web’s decoupled architecture and its hierarchical way of managing and synchronizing content (BluePrinting) are leaps and bounds ahead of the marketplace. They provide both the solution to the content hub and the experience layer of the problem. Without any hesitation, I can say that SDL offers the best option for enterprise companies that want to manage content and translations for multinational, multi-market digital content. No one comes close when it comes to their integrations with translation and language for managing and delivering global content. In terms of shorter time to market for companies that publish high volume content and assets, its ability to reuse, generate and combine content in different ways, enterprise companies save a tremendous amount of hours using SDL technology. We believe in the SDL products and have been using them for a long time. We feel that it has a crucial role in that balance between data, content and design. But that the ultimate objective is to engage with customers in such a way that will produce measurable business outputs.